Friday to Monday, 11 a.m. - 5 p.m. Now Open Monday! Stop by any weekend, Friday - Monday from 11 a.m. to 5 p.m. We are closed Tuesday-Thursday and on major holidays including New Year's Day, Easter Sunday, Labor Day, Thanksgiving Day, Christmas Day. 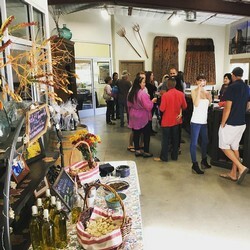 Tasting fee is $10 for 5 tastes per person but is waived with the purchase of a bottle of wine. We usually have about 7 of our Spanish varietal and Tizona wines open at any given time. Group reservations are required for groups of 8 or more. Please call us at (209) 642-8880 to schedule your visit. We welcome bicyclists! Stop in for a quick wine tasting and water refill while on your ride. Facility Use: We are frequently asked, but we do not rent our facility for weddings or other private events. We are pet friendly! No need to leave your fur babies at home. They will love sitting with you as you enjoy our beautiful grounds. 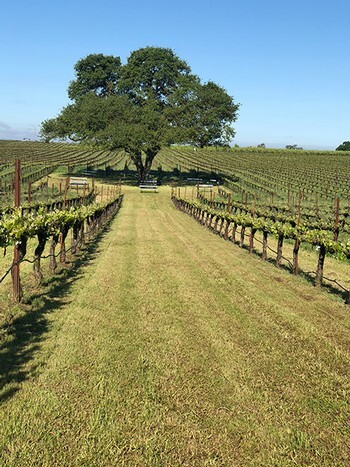 Picnic while you taste our wines and enjoy the beautiful view of the rolling hills of Terra Alta Vineyard.There are many places to collect your picnic supplies, here are a few we recommend. In Lodi: Cheese Central at 11 N School St, Fiori's Butcher Shoppe & Deli on 400 W. Lodi Ave. has curbside pickup. In Lockeford: Young's Payless Market at 18980 CA-88 has a great cheese section, Donkey J's Deli at 18966 CA-88 is our goto sandwich shop. 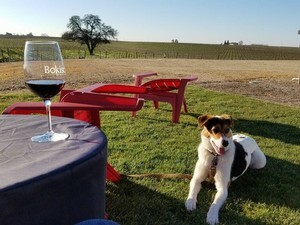 Sign up for our eNews to be among the first to know when our tasting room is having a special event. Scroll to the bottom of this page to sign up.